October 2017 is jam-packed with great community events. Some of them happen right on the Carrollton GreenBelt, some downtown, but all of them are a great excuse to get out, have fun and be active. Southwire’s Community Day is Saturday, October 7. Check out the Southwire Blog to read about all the fun activities throughout the day, including a 5K race, electronics recycling, a charity cruise-in, a free concert featuring .38 Special, and more! All donations received throughout the day will benefit the CARROLL COUNTY HUMANE SOCIETY and you’ll be able to cast your vote for which are cutest – Pups or Kittens – to help us raise awareness for their great cause! Race day sign-in begins at 7:30 AM. Warm up with us at 8:15 AM and the race will kick off promptly at 8:30 AM. This year’s race route is a certified Peachtree qualifier! It will feature Carrollton’s scenic Greenbelt, beginning in the back of Southwire’s corporate parking area, continuing along Richard’s Lake and then past Ayers Dairy Farm and so on. Awards will be given out based on age groups, along with a top male/female overall. Parking is available in Southwire’s corporate parking lot. Please arrive in time to sign-in on event day! Strollers are always welcome, but no “furry babies” please. 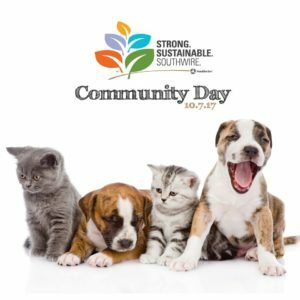 Visit www.southwire.com/communityday2017 or call (770) 832-4729 to find out more. 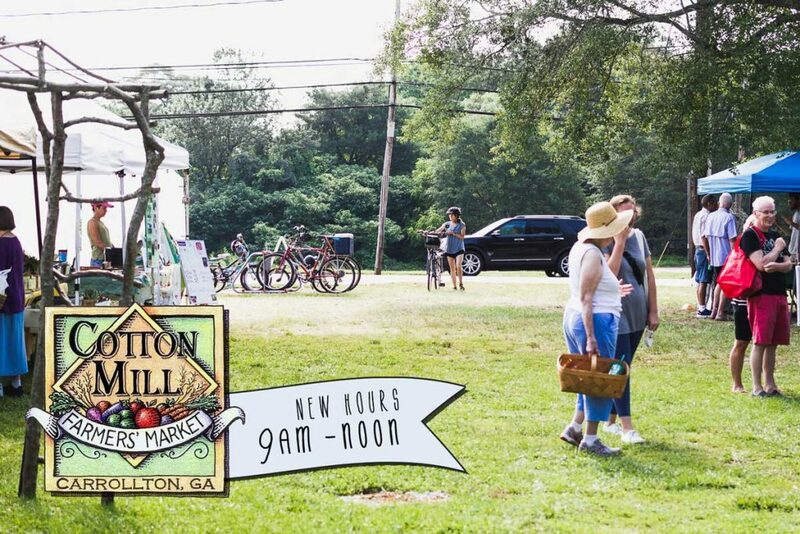 The Cotton Mill Farmers Market is open every Saturday, but starting October 7, the market will open at 9 am. The farmers market features local vendors and is a perfect destination for a morning walk or ride. Located on Dixie Street between the hospital’s parking deck and Keep Carroll Beautiful’s office, the market is just feet off the Carrollton GreenBelt. Yes, it’s time to ride the Carrollton GreenBelt for a good cause! The 5th annual Tour de Carroll is coming up in just over a week. Register by Friday, October 6, to utilize the early bird fee. This year, for the first time in the event’s 5 year history, we will ride the entire length of the Carrollton GreenBelt! This may take anywhere from 1,5 to 4 hours, depending on your skill level, stamina, if you are riding by yourself, or with children. Bring water! Snacks like granola bars, raisins, fruit, are a good idea, too. Look out for a Tour de Carroll guide coming in the next few days! 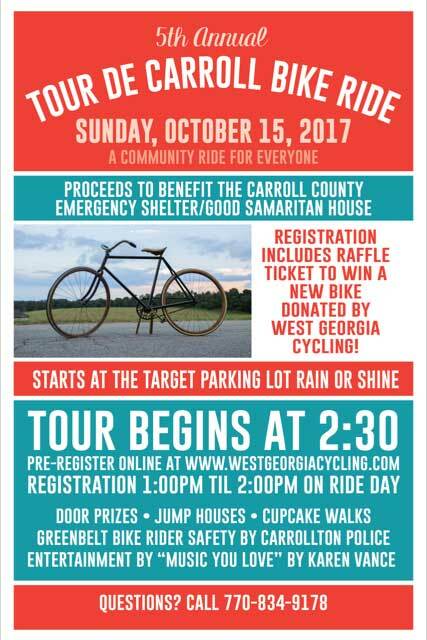 Tour De Carroll is a family-friendly community event benefiting the Carroll County Domestic Violence Shelter & Good Samaritan House. Make checks payable to “CCES”. 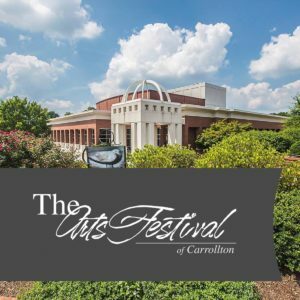 Although not directly on the GreenBelt, The Arts Festival of Carrollton is a great family event happening in the heart of the city. If you plan on visiting the Art Center, please consider arriving by bike, or walking! The annual Arts Festival is a two-day event held the second weekend in October, which gives the community the opportunity to enjoy wonderful art, live demonstrations, and entertainment. 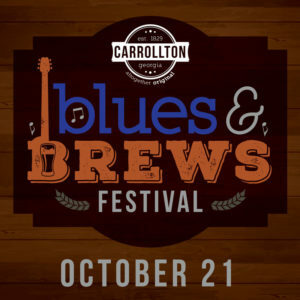 Another occasion to ride your bike to a downtown event, the Blues and Brews Festival features live music at the AMP at Adamson Square. Music and beer tasting will kick-off at 2:00 pm and beer tastings will take place until 7:00 pm. But the fun won’t stop then! Grab dinner at one of the phenomenal downtown restaurants and stick around for more Blues throughout the night. Order online for only $25! Bring your email confirmation with valid ID to receive your wristband and souvenir cup at Will Call. Brews tickets will also be available for purchase at the event for $30. Must be 21 years of age with a valid ID. Join the Parks and Recreation Department at a family-friendly Fall Festival on the Square for trick-or-treating, games, inflatables and costume contest! Kids 0-12 can participate in our costume contest at 12:00 pm at the AMP. Have fun and see you on the trail!